Un jour, le loup de mer reҫu la visite du loup de terre. Les deux se connaissaient déjà depuis l’école des loups. Le loup de mer avait parcouru le monde et vécut beaucoup d’aventures et il rentra chez lui riche de trésors et d’expériences. Le loup de terre était resté chez soi dans sa tannière. Il rencontra une louve de terre et eut des louveteaux de terre. Et maintenant, il a beaucoup de petits-louveteaux et des arrière-petits-louveteaux, et tous sont devenus de vrais, bons loups de terre. «Parfois j’aimerais refaire ma vie», dit le loup de terre au loup de mer. «C’est la même chose pour moi», dit ce dernier. «Je ferais beaucoup de choses différemment», dit le loup de terre. «Oui, moi aussi», répondit le loup de mer. «Je naviguerais les océans», rêva le loup de terre. «Je me marierais», soupira le loup de mer. «Je vivrais des aventures», expliqua le loup de terre. «J’aurais des louveteaux», dit le loup de mer. «Je serais un loup de mer riche. J’aurais vécu des expériences périlleuses et magnifiques, dont je pourrais raconter les histoires», dit le loup de terre avec enthousiasme. «Moi, j’aurais des petits-enfants et des arrière-petits-enfants qui m’aimeraient et qui s’occuperaient de moi quand je serais vieux et malade», assura le loup de mer. A number of researchers wanted to find out why salmon die after spawning, so they fished a number of specimens out of the river, fitted them with radio transmitters and placed them back into the sea. And what do you think happened? The animals stayed alive. The story “Renewed Life” makes it clear that life plans and goals play a vital role in an individual’s happiness, health and life expectancy. The story “My Aim in Life” calls into question the absoluteness of existing life goals, and encourages the listener to formulate his or her own values.The story “Renewed Life” makes it clear that life plans and goals play a vital role in an individual’s happiness, health and life expectancy. When I visited the Pisa Baptistry close to the city’s cathedral, I thought to myself, ‘They’ve turned it into a temple to commerce!’ It raised my hackles to pay to enter a church and then find myself surrounded by hundreds of frantic tourists rushing around and taking photographs of everything. Many kept checking their watches, because a singer was paid to perform every hour in order to demonstrate the building’s wonderful acoustics. Should a church not be a place of prayer and devotion? After climbing up to the gallery, I thought, ‘Surely no one will object if I turn this temple to Mammon back into a house of God.’ It took me a while to screw up the courage, but finally I sang the opening line of a psalm loudly and clearly into the open space, ‘Laudate omnes gentes, laudate dominum.’ The acoustics really were superb. Everything went quiet in the church, and although everyone looked around to find out who was singing, the echoes made it difficult for them to locate me. The security staff searching frantically for the perpetrator also found had a hard task on their hands, but by the end of the verse one had spotted me. He waited for me to start singing again in order to catch me red-handed, since it would otherwise have been easy for me to deny my act of sacrilege. I looked around the building in a daze. “Thank you,” said a woman standing next to me. “That was wonderful.” I too felt better after having sung the psalm. When the last echo had faded away, I left the house of God, giving a sly grin to the security guard who was still watching me. The story “Sacrilege” illustrates that standing up for your values represents a value in itself. In cases where these values are opposed to the interests of others, it is often necessary to find a balance between defending your ideals in public and taking a less conspicuous approach. The story can also be used to encourage clients not to hide their light under a bushel and to present a self-confident image during interactions with others. Fee: 460 €. Early booking prices : Until end of… July 2019: 350 €… November 2019: 390 €… March 2020: 430 € / June 20: 340 €. While early birds can save a lot, the cancellation fee (for cancellations till 4 weeks before the festival) is only 25 €. For registration or further information please use the contact form, write to stefan.hammel @ hsb-westpfalz.de or contact the Institute of Hypno-Systemic Consultation via 0049-631-3702093. The story “Gockle’s Good Luck” reminds us that we cannot always recognise and accept happiness and that some people have reasons of their own for not improving their situation. It also reminds us that we need goals for which we fight and that unexpected success may overtax our capacities. In conversation with parents, for example, the story can be used to make it clear that children and teenagers should not be allowed to become accustomed to taking an affluent lifestyle for granted, and that they need to experience achieving success and possessions through their own efforts. The story can also be used to alert listeners to the fact that they are taking skills for granted and overlooking opportunities for action, even though – or perhaps because – they are present in abundance. Festival- DVDs and -CDs are now available in our shop! The 2nd International Festival of Therapeutic Storytelling took place on October 5th to 7th, 2018, in Otterberg / Germany. The festival was organized by the Institute of Hypno-Systemic Consultation in Kaiserslautern (Stefan Hammel) and the Milton-Erickson-Institute Luxembourg (Marie-Jeanne Bremer). Congress languages were German, English and French. Our thanks goes to the speakers, helpers and participants for this successful event. Please find HERE recordings of selected lectures. How can we build up a concept of reality supporting us in everyday life? Stefan Hammel explains what we can do in order to change insecurity, anxiety, body symptoms like pain and other unpleasant experiences into something helpful. Here is a little video called “Put your Fear in the Cloakroom” with English subtitles. It was filmed during a workshop on how to support the dying in their last hours. The workshop was part of a conference on Ericksonian hypnotherapy in Bad Kissingen, Germany. On the video I am explaining a narrative technique for reducing pain, breath problems, worry and fear with dying patients and to helpt them to let go of life. I’s out! On Saturday I held the first copy of the “Handbook of Theapeutic Storytelling” in my hands. The translation of the German book “Handbuch des Therapeutischen Erzählens” has been published by Routledge (Taylor & Francis group) in London. Its 306 page s cost 29.99 £ or 35 Euros (at shop.stefanhammel.de). The Handbook of Therapeutic Storytelling enables people in the healing professions to utilise storytelling, pictures and metaphors as interventions to help their patients. Communicating in parallel worlds and using simple images and solutions can help to generate positive attitudes, which can then be nurtured and enhanced to great effect. Following an “Introduction” to the therapeutic use of stories, which closes with helpful “Instructions for use”, the book is divided into two parts, both of which contain a series of easily accessible chapters. Part One includes stories with specific therapeutic applications linked to symptoms and situations. Part Two explains and investigates methods and offers a wide range of tools; these include trance inductions, adaptation hints, reframing, the use of metaphor and intervention techniques, how stories can be structured, and how to invent your own. The book also contains a detailed reference section with cross-referenced key words to help you find the story or tool that you need. 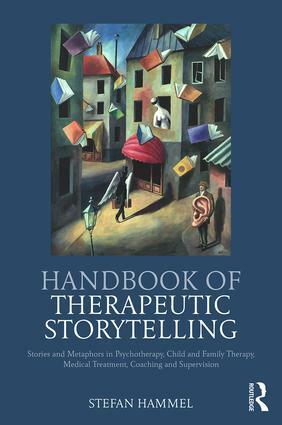 With clear guidance on how stories can be applied to encourage positive change in people, groups and organisations, the Handbook of Therapeutic Storytelling is an essential resource for psychotherapists and other professions of health and social care in a range of different settings, as well as coaches, supervisors and management professionals.